CINCINNATI -- During last year’s presidential campaign, then-candidate Donald Trump repeatedly complained that the election process was rigged against him. If the system had been rigged to defeat him, the riggers obviously didn’t do a very good job. Some fresh research shows that there may be a way to extinguish any hint of backroom political rigging and to usher in a period in which there is some reliance on purely objective mathematical rigor. In a series of stories, the Associated Press examines the country’s 435 Congressional districts and some 4,700 state legislative districts in an effort to determine if partisan gerrymandering has emerged as the single most important factor in who wins elections. The AP analysis shows that Ohio, a key battleground when America elects presidents, and reliably Republican Kentucky both have an overwhelming number of districts – state and Congressional – that favor GOP candidates over Democrats by sizeable margins. The wire service stories are being distributed as partisan gerrymandering is coming under intense scrutiny. Earlier in June, the U.S. Supreme Court agreed to hear arguments in the fall about a challenge to a Republican-led effort in Wisconsin to redraw state legislative districts. Although comprehensive redistricting efforts won’t begin until after the 2020 U.S. census is completed, the complicated, time-consuming and sometimes contentious process is already under discussion in Ohio and Kentucky. Ohio voters overwhelmingly approved a ballot issue in November 2015 designed to overhaul how state legislative districts are drawn in an effort to rid the state of partisan gerrymandering. 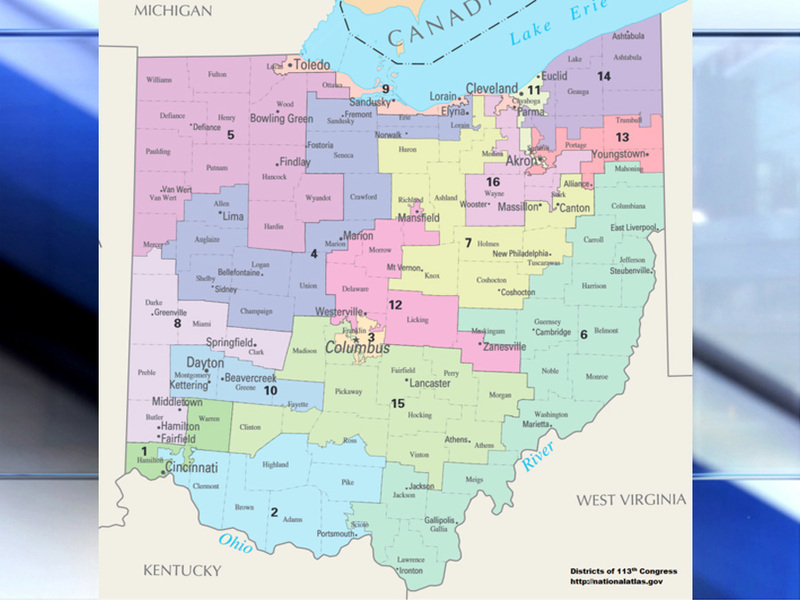 The League of Women Voters of Ohio , which led the 2015 effort, is pushing a similar measure now that would revamp how Congressional districts are configured in an anti-gerrymandering ballot initiative. “This (redistricting) is what we live and breathe right now,” said Carrie Davis, executive director of the league in Ohio, where its headquarters office is in Columbus. 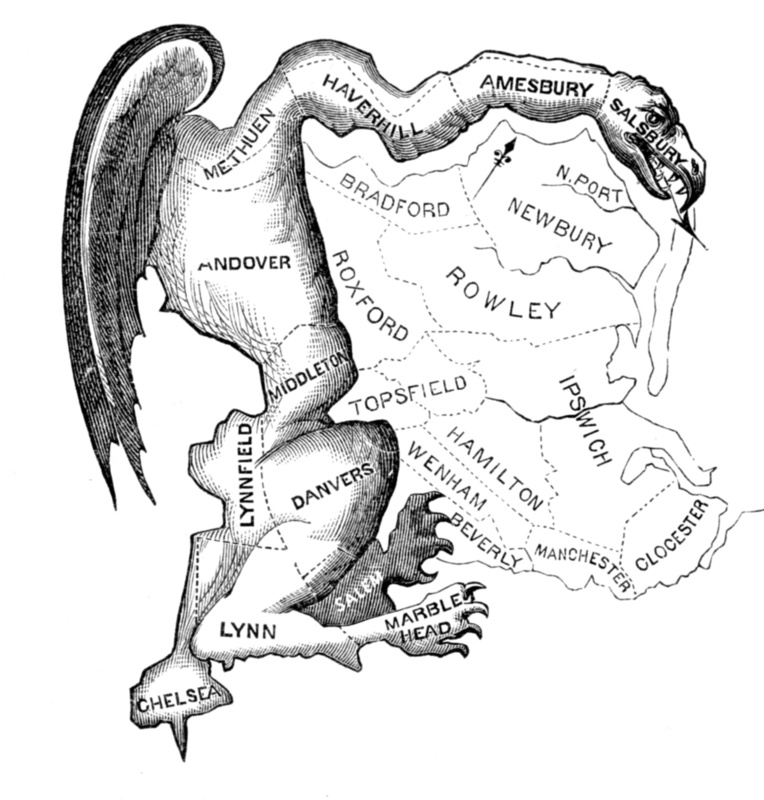 The term gerrymander was created to describe the legislative districts drawn under Massachusetts Gov. Elbridge Gerry in 1812 to benefit his party. The AP analysis of election results was based on research that calculates what is called an “efficiency gap.” That number is designed to show what kind of an advantage one party can expect to have when districts are gerrymandered in that party’s favor. Perfectly balanced districts that show no impact of partisan gerrymandering would have an efficiency gap of zero. Larger numbers indicate a more pronounced effect of drawing districts that favor one party over the other. The AP's research showed that four times as many states have state legislative districts that seem to favor Republican candidates over Democrats and that GOP candidates have a decided advantage over Democrats by about a three-to-one margin in Congressional districts in the 24 largest states. Ohio sends 16 people to the U.S. House of Representatives; of those, 12 – 75 percent – are Republicans. Compare that to the state’s vote totals. In November, nearly 3 million Ohioans voted to send Republicans to Washington, while 2.15 million people supported Democrats in those races. On average for all of the districts in the state, Republicans received 57.5 percent of the vote compared to 42.5 percent for Democrats. The research by University of Chicago law professor Nick Stephanopolous and Eric McGhee of the nonpartisan Public Policy Institute of California shows that numbers like those create a 10 percent “efficiency gap” that favors Republicans in Ohio and indicates that partisan gerrymandering had a substantial impact on how the districts were drawn. The efficiency gap number in Kentucky was just under 3 percent, even though Kentuckians on average were far more likely to vote for Republicans in the state’s six Congressional districts. In November, Republicans received an average of 65 percent of the votes across the six districts; the GOP won five, or 83 percent, of them. Republicans hold a 66-33 majority in the Ohio House of Representatives, where the research shows an efficiency gap of 5.3 percent. The numbers are surprisingly similar in Kentucky, where the GOP holds a 64-36 lead in the House, and the efficiency gap is 2.9 percent. She said gerrymandering also fuels the sense of the polarization in the country by creating “safe seats” that are, in effect, decided in the primary election, which usually attracts highly partisan voters rather than moderates who might vote only in general elections. “In 2015, there was no organized opposition (to the redistricting plan), and our view is that voters sent a clear message that we need to do the same thing with the Congressional districts,” Davis said. Ohio's Congressional districts as they were redrawn after the 2010 census. When districts are packed, they are drawn so that voters who generally favor one party are jammed into one district that is, in effect, conceded as a loss by the party that drew the districts. The theory is that, although the voters may win one district by an overwhelming margin, their clout at the ballot box will be restricted to one district and won’t be a factor elsewhere. When gerrymandering is used to “crack” a district, voters of one persuasion are dispersed among several districts on the assumption that they won’t be able to assemble a majority that could win a seat. The “efficiency gap” research uses a mathematical formula to calculate what it labels “wasted votes” – those cast for a candidate who loses and those cast for a winning candidate beyond the minimum number of votes that he or she needed to win a race. “It’s a mathematical formula that is not subjective, and there’s some appeal to that,” Davis said. “It’s a useful tool, but on its own it’s not a solution to the (gerrymandering) problem,” was the assessment of the “efficiency gap” by Douglas M. Johnson, a research fellow at the Rose Institute of State and Local Government at Claremont McKenna College in Claremont, California, and a specialist on questions about redistricting. Efficiency-gap data are being used in the Wisconsin case that will be heard by the U.S. Supreme Court, which decided by a 5-4 margin in 2004 in a Pennsylvania case that some reasonable amount of gerrymandering did not violate the U.S. Constitution. Based on his role in the 2004 ruling, Justice Anthony M. Kennedy is thought to be the key vote in the Wisconsin case. Johnson said Kennedy was convinced that the proposed solution to the gerrymandering issue in Pennsylvania was “too complicated for the courts to administer.” By using the math-based efficiency-gap data, “they may be trying to find a measuring stick to appeal to Justice Kennedy,” he said. In both Ohio and Kentucky, state legislators are responsible for drawing legislative districts immediately after the state receives U.S. Census Bureau data that provides information about where people are living. Hamilton County Director of Elections Sherry Poland said much of the work on redrawing the districts is done by the legislators and the Ohio Legislative Service Commission . Poland said her office is responsible only for redrawing precinct lines and making sure that districts in the county conform to the districts drawn in Columbus. Kentucky State Sen. Chris McDaniel, a Taylor Mill Republican whose 23rd District includes the northern end of Kenton County, serves on the interim committee on state government, which is expected to play a decisive role in redistricting after the 2020 census. Creating districts that have similar populations and minimizing the number of counties that are split between two districts are critically important in Kentucky, McDaniel said. McDaniel was also realistic about what may happen once both sides begin work on district maps. “I’ve never seen anything about redistricting that doesn’t have politics involved,” he said. Ohio's 1st Congressional District was redrawn after the 2010 census to bolster GOP chances by adding heavily Republican Warren County to it. That's called packing a district.